When observing the actions of others, humans carry out inferences about why the others acted as they did, and what this implies about their view of the world. Humans also use the fact that their actions will be interpreted in this manner when observed by others, allowing them to act informatively and thereby communicate efficiently with others. 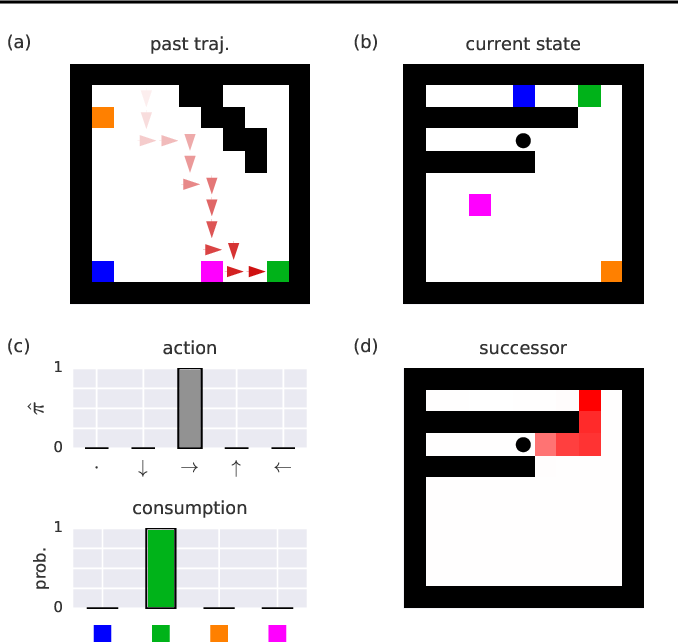 Although learning algorithms have recently achieved superhuman performance in a number of two-player, zero-sum games, scalable multi-agent reinforcement learning algorithms that can discover effective strategies and conventions in complex, partially observable settings have proven elusive. 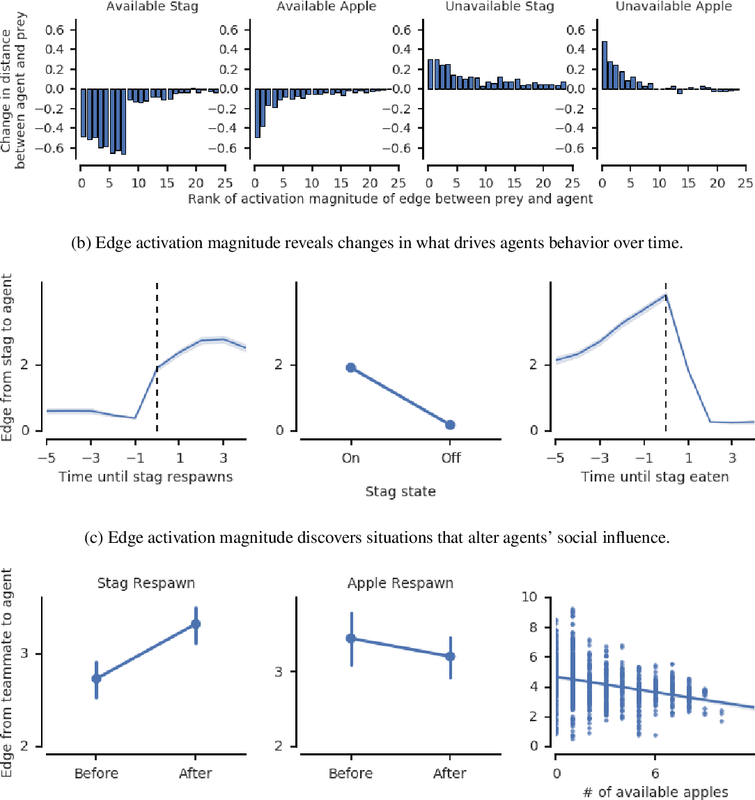 We present the Bayesian action decoder (BAD), a new multi-agent learning method that uses an approximate Bayesian update to obtain a public belief that conditions on the actions taken by all agents in the environment. 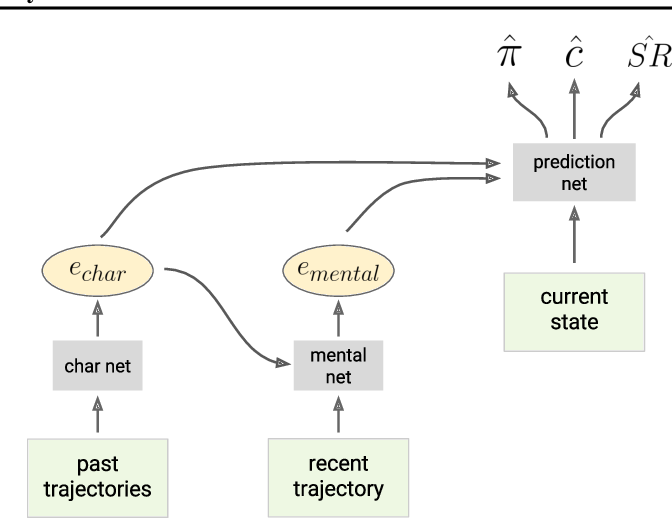 Together with the public belief, this Bayesian update effectively defines a new Markov decision process, the public belief MDP, in which the action space consists of deterministic partial policies, parameterised by deep neural networks, that can be sampled for a given public state. It exploits the fact that an agent acting only on this public belief state can still learn to use its private information if the action space is augmented to be over partial policies mapping private information into environment actions. The Bayesian update is also closely related to the theory of mind reasoning that humans carry out when observing others' actions. We first validate BAD on a proof-of-principle two-step matrix game, where it outperforms traditional policy gradient methods. We then evaluate BAD on the challenging, cooperative partial-information card game Hanabi, where in the two-player setting the method surpasses all previously published learning and hand-coded approaches. From the early days of computing, games have been important testbeds for studying how well machines can do sophisticated decision making. 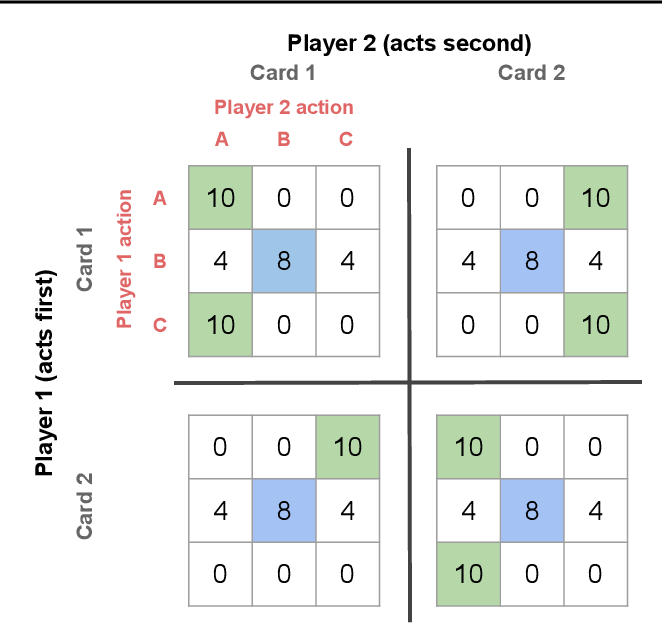 In recent years, machine learning has made dramatic advances with artificial agents reaching superhuman performance in challenge domains like Go, Atari, and some variants of poker. As with their predecessors of chess, checkers, and backgammon, these game domains have driven research by providing sophisticated yet well-defined challenges for artificial intelligence practitioners. We continue this tradition by proposing the game of Hanabi as a new challenge domain with novel problems that arise from its combination of purely cooperative gameplay and imperfect information in a two to five player setting. In particular, we argue that Hanabi elevates reasoning about the beliefs and intentions of other agents to the foreground. We believe developing novel techniques capable of imbuing artificial agents with such theory of mind will not only be crucial for their success in Hanabi, but also in broader collaborative efforts, and especially those with human partners. 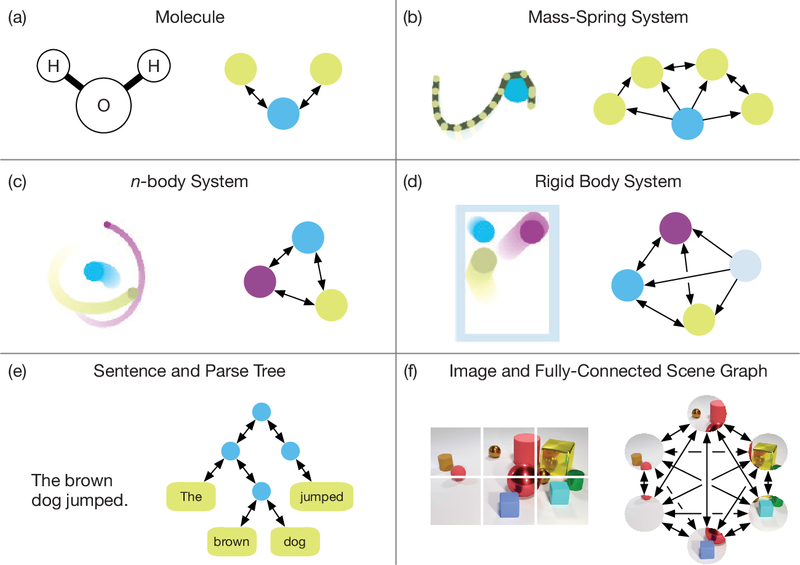 To facilitate future research, we introduce the open-source Hanabi Learning Environment, propose an experimental framework for the research community to evaluate algorithmic advances, and assess the performance of current state-of-the-art techniques. Music summarization allows for higher efficiency in processing, storage, and sharing of datasets. Machine-oriented approaches, being agnostic to human consumption, optimize these aspects even further. Such summaries have already been successfully validated in some MIR tasks. We now generalize previous conclusions by evaluating the impact of generic summarization of music from a probabilistic perspective. We estimate Gaussian distributions for original and summarized songs and compute their relative entropy, in order to measure information loss incurred by summarization. 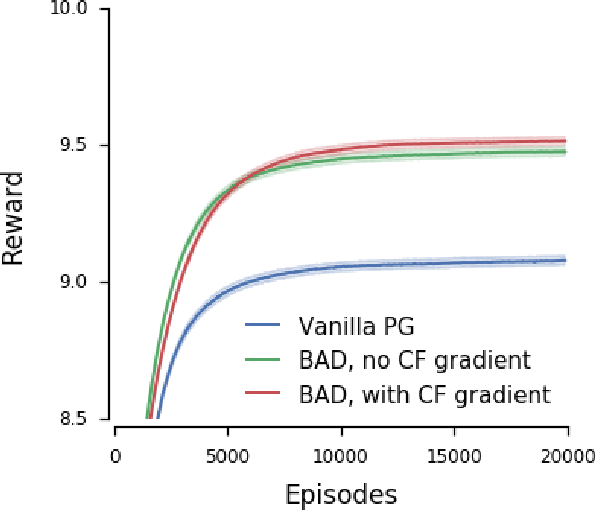 Our results suggest that relative entropy is a good predictor of summarization performance in the context of tasks relying on a bag-of-features model. Based on this observation, we further propose a straightforward yet expressive summarizer, which minimizes relative entropy with respect to the original song, that objectively outperforms previous methods and is better suited to avoid potential copyright issues. 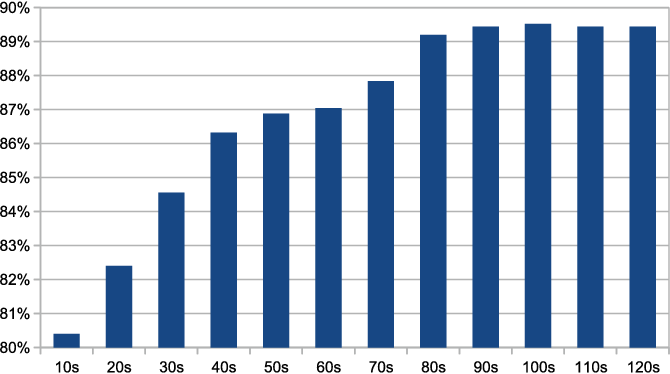 In order to satisfy processing time constraints, many MIR tasks process only a segment of the whole music signal. This practice may lead to decreasing performance, since the most important information for the tasks may not be in those processed segments. 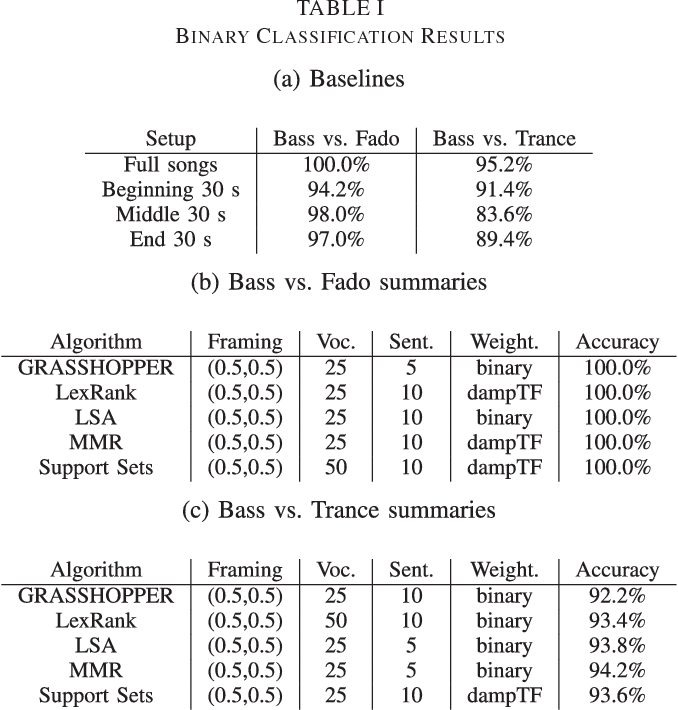 In this paper, we leverage generic summarization algorithms, previously applied to text and speech summarization, to summarize items in music datasets. These algorithms build summaries, that are both concise and diverse, by selecting appropriate segments from the input signal which makes them good candidates to summarize music as well. We evaluate the summarization process on binary and multiclass music genre classification tasks, by comparing the performance obtained using summarized datasets against the performances obtained using continuous segments (which is the traditional method used for addressing the previously mentioned time constraints) and full songs of the same original dataset. 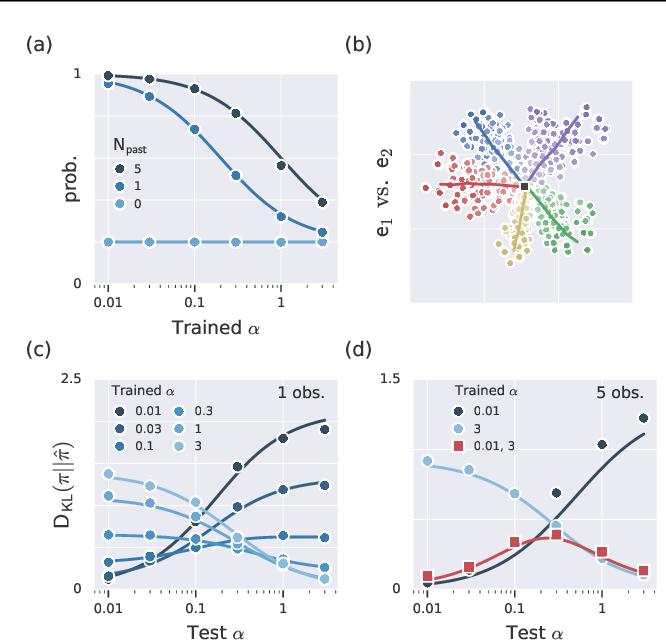 We show that GRASSHOPPER, LexRank, LSA, MMR, and a Support Sets-based Centrality model improve classification performance when compared to selected 30-second baselines. 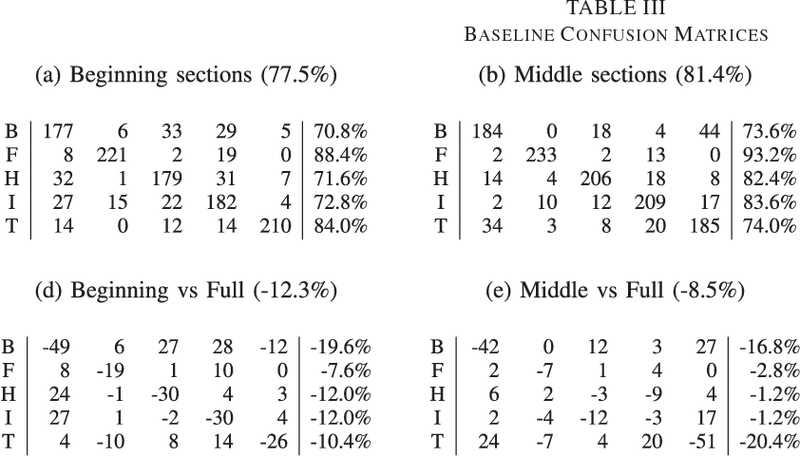 We also show that summarized datasets lead to a classification performance whose difference is not statistically significant from using full songs. Furthermore, we make an argument stating the advantages of sharing summarized datasets for future MIR research.